It’s hard to be anything but one of the greatest bands ever when you’re line-up consists of the piercing falsetto of Robert Plant, legendary guitarist Jimmy Page, the versatile John Paul Jones on bass, and the unbridled force of nature that was John Bonham manning the drums. 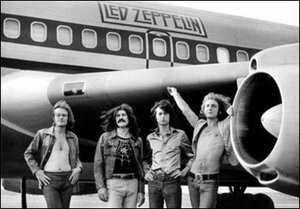 Led Zeppelin emerged from the ashes of another prolific band, the Yardbirds, whose incredibly influential frontman (Jeff Beck) left to pursue a solo career, leaving then bassist Page to rebuild the group from the ground up. The heavy metal forefathers produced the breadth of their work between 1969 and 1975, and released one acclaimed album after the next in Physical Graffiti, Houses of the Holy, and their four self-titled epics (Led Zeppelin I through IV), all of which were famously dismissed at the time by Rolling Stone magazine, who later issued a mea culpa in 2006. A chronic drinker, Bonham died on September 25, 1980 from alcohol poisoning, and with him went his bandmates’ desire to perform as Led Zeppelin. Plant, Page, and Jones would eventually reunite in 2007 for a one-off performance at the O2 Arena in London in honor of beloved music executive Ahmet Ertegun, and played “Black Dog”, “Whole Lotta Love”, and the often imitated but never duplicated, “Stairway to Heaven”, for the very last time.